Copy and paste the link below into your browser to learn more about Third & Wall and how we can bring fabulous and exclusive art to your interiors! 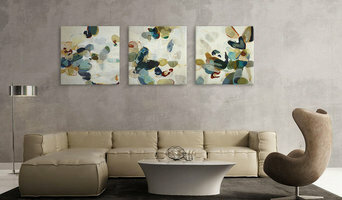 <a rel="nofollow" target="_blank" href="https://vimeo.com/130488810">https://vimeo.com/130488810</a> Third & Wall Art Group is a Seattle based art consulting firm offering original artworks, print-on-demand, and art consultation for residential, corporate, hospitality, and healthcare interiors. We are committed to representing exceptional artists whose work meets the needs and challenges of the decorative art market. Visit our showroom in South Lake Union to see how we can help you. Our goal is to have inspired and happy artists, customers and employees. Artists are empowered to create powerful, stylish works that express their unique views of the world; customers have user-friendly access to exclusive, innovative art, selling tools and design solutions; and employees have a fun, challenging environment in which to grow and develop. And along the way, we experience success, develop lasting relationships and make a difference. We are a custom fabrication shop in Seattle Wa. We fabricate to spec, as well as design and build furniture, sculpture and architectural objects. We specialize in artisan works that usually include multi material construction. We work in many materials including metal, wood, glass, clay and concrete. We cast, weld and smith many different metals, and are proficient in many different mold making methods and materials. Tamara Hergert is a Seattle-based artist, illustrator and muralist specializing in creating exceptionally beautiful murals, paintings, and illustrations. She is one of the best artists and illustrators in the Seattle - Tacoma area and is a pleasure to work with. Tamara will be happy to hear from you regarding a project that you have in mind, so please send her an email or give a call. 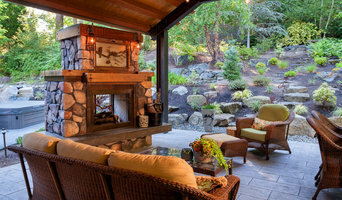 Crafthammer Design is where art meets function to fulfill the needs of those who desire something unique and of higher quality to enhance their indoor and outdoor living experience. With an affinity for the master sculpters, metal forgers, and wood workers of days gone by, Crafthammer Design hopes to rekindle that passion for working with ones hands to create things of beauty for those who appreciate true quality and craftsmanship. We create custom sheet metal construction components that are both functional and beautiful. The things that you interact with every day in your home have an impact on your life. If they don't work well, look pleasing, and stay that way - they can be a source of irritation and frustration. We try for the elegant solution, using best practice standards; and keep a weather eye on detail so that furnishings and building envelopes are a source of comfort, pride and satisfaction. I enjoy being part of that. George Scott specializes in Art Glass design and fabrication as it applies to architectural features, lighting, surfaces and sculpture. All of his work is done in his Seattle studio, using a combination of techniques including fusing, slumping, blowing and casting. George has over thirty years of experience working in residential, restaurant, casino, hotel, and educational facilities. Fabrication techniques include glass blowing, casting, fusing, kiln forming, and associated metal work. Please message me with any inquiries as I'm happy to make custom unique work for your home or business! We ship nation wide! Beeswax painter, living in the PNW , collaborating closely with designers and collectors to make one-of-a-kind glowing pieces of artwork. Each encaustic art piece is made by slowly adding thin layers of beeswax, pure pigments, and fire. All art unique, and textured in a way that only encaustic art can be. 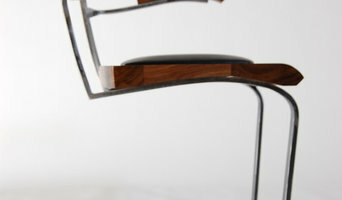 Wonderful handmade finishes both contemporary, ecclectic, and traditional. 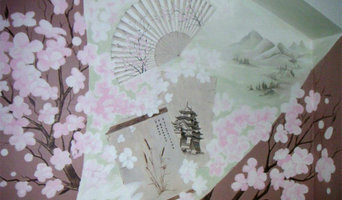 Plasters, faux finishes, murals, collage, printmakiing etc. Environmentally friendly products used as well as reuse / upcycling of elements to create objects and art works. Paradise Studios is committed to excellence in interior design and luxury surfaces. We also provide an unlimited spectrum of stunning, extraordinary fine finishes to achieve any effect imaginable. We are committed to artistic excellence and craftsmanship in every project. Every project is designed custom to you, your unique space, and your individual needs. Artist, designer and general contractor Terrell Lozada started her business in 1995. She specializes in remodel design and in creating custom finishes and decorative details that infuse new life and beauty into homes. She values healthy environments and believes that living in the presence of beauty is a key component to well being. We provide specialty painting services for home and businesses, catering to the uniquely individual needs of each client. Bumblejax creates gallery quality wall art from any digital photo using unique materials such as acrylic, bamboo and aluminum. We make it easy for families to create beautiful art for their home using their own personal photos. Studio Make is a full service design and fabrication company specializing in custom precast and site cast concrete, specialty steel fabrication , and wood working. Mark Olson's extensive education and experience drives the creativity and fabrication of all Unique Art Glass pieces. Mark started working with glass in 1976, going on to work as a research and development product designer for a large stained glass manufacturer for 10 years. Mark attended the prestigious Pilchuck Glass School, studying under Master Glass Artists Dale Chihuly and Ludwig Shaffrafh and was later recruited as a designer for a Seattle area stained glass studio designing and producing commissions for many local area residents. Mark creates his designs with careful attention to architecture, interior design, and function, often collaborating with architects, designers, and other craftsmen. He strongly believes in the quality of his craft and the honesty of its construction. In 1989 Mark created Unique Art Glass, a family owned business and continues to produce works for many Northwest homes, churches, and businesses. Mark's work has been published in trade magazines, brochures and most recently the Greater Puget Sound area magazine Pacific. Whether you’re looking for a fun and functional piece, such as ceramics or pottery, or prefer murals and decorative painting, you’ll find many Seattle, WA artists, muralists and artisans on our Professional pages, ready to include you in a creative process that will result in a stylish and personality-filled home. There are a wide selection of Seattle, WA artisans listed on Houzz, including muralists, painters, ceramic artists, potters, ironworkers, photographers, sculpturalists, designers of decorative glass, metal wall art, abstract art, home accessories, and more. Even everyday items such as tableware, tiles, splashbacks, lampshades and bedheads can be handcrafted, painted or designed by an artisan. You will also find artisans who specialise in bespoke designs, as well as those who offer artwork consultancy. Find artists and craftsmen on Houzz. Peruse portfolios in the Professionals section to find abstract, traditional, and contemporary artists in Seattle, WA. Read reviews and contact artists directly to ask them more about their work.